The Whiskey Gentry learn to let go of musical competition on their latest album, Dead Ringer. The phone rang twice before Lauren Staley picked up. She answered with a twangy “Hey there,” and before long, I could hear the clang of pots and pans as she went about making dinner, the click-clacking of her dog’s paws on the floor, and the soft lull of whatever tunes she had playing – an orchestra of household sounds that is her daily soundtrack when she’s back in Atlanta. “It’s good to be home,” Staley tells me. 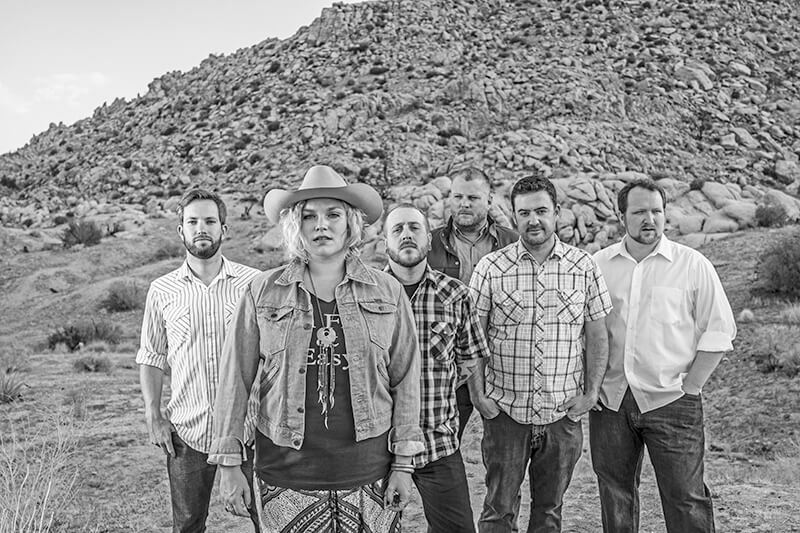 As the frontwoman for the country/Americana sextet The Whiskey Gentry, Staley and her partner in music and life, Jason Morrow, have been leading their band around the country on tour. Most recently, they spent a few days at South By Southwest (SXSW), performing and enjoying the sights and sounds of creativity. An event like that requires a lot of the participating acts, Staley says. Getting themselves, their gear, and their band to the right city on the right days is one thing, but once they get there, hauling all those things from the van, to off-stage, to the stage, back to the van each day takes a toll on their bodies. And that’s all not factoring in the actual performance. “South by is also like, hazing. ‘Come out to Texas, make no money, do all of the things,’” she jokes. No matter how hard it seems, Staley is still able to put it all in perspective. She, and her band, have worked extremely hard to be able to call their passion project their career. Not too long ago, Staley was working full-time for Georgia’s Department of Labor, burning the candle at both ends, trying to make the music and her day job work. When she thinks about it now, she sounds bewildered that she was able to make that lifestyle last as long as she did. With the encouragement of her husband and creative partner, Staley decided to give music a full-time try. Now, she lives off the idea that ‘you get out what you put in,’ saying “you have to live it every day.” She’s committed, and it shows. The band’s latest release, Dead Ringer (2017), is a departure from what might be familiar to fans of The Whiskey Gentry. Their previous albums, Please Make Welcome (2011) and Holly Grove (2013) sound like a young band just gearing up and testing the waters in comparison. Honestly, that very well may be the case. According to Staley, the making of and touring around Holly Grove really caused her to reflect on her life as a musician, and question whether this was right for her. That reverse psychology maneuver ultimately worked, and Staley got back to work. With Jason’s help, and the collaboration of their band – bassist Sam Griffin, drummer Nico Lembo, fiddle player Rurik Nunan, mandolin player Michael Smith, Chesley Lowe on banjo, and keys player Les Hall – they created a record that is deeply personal, less polished, and more reflective of who they are as a group and who she is as a musician. To make something that comprehensive and all-encompassing is no small task. But Staley says that this time, the songwriting came a little easier. That shift from competition to collaboration allowed the vibe of the whole writing and recording process to change. It helped Staley to come out of her shell as a songwriter and lean on others in a more meaningful way, creatively. “[The album] feels like more of an accurate representation of who we are at this point in time,” she says. From the lyrics on songs like the title track, “Dead Ringer,” and the recording techniques on tracks like “If You Were an Astronaut,” there’s a transparency that just wasn’t there on the previous two LPs. When asked about the album, those are the two songs Staley stops to comment on. You can hear that vulnerability on the record. Staley says she hears it too, and that most of that rawness came naturally. They recorded at Echo Mountain Recording in Asheville, NC, which is notorious for its big studio room known simply as “The Church.” For the first time ever, they recorded with a producer – Les Hall – who pushed them to test their creative boundaries. Staley says she won’t go back to recording alone. The record was tracked on 2-inch tape, which was also a new technique for the group. And finally, they let this album have a live-band feel by miking the band all together in the same room and letting the musical magic just happen. The creative growth of the band, and Staley’s own personal shift has allowed The Whiskey Gentry to truly come into their own on this album. It’s raw and refined without being polished. It has flaws and imperfections, but ultimately documents a moment in time that’s real and honest for the group.